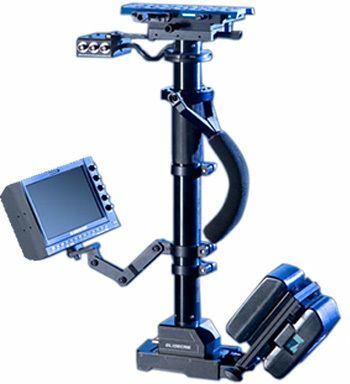 The Glidecam X-30 stabilization system is one of Glidecam’s newest and most advanced body-mounted systems that can be used with cameras weighing from 6,8 kg to 13,6 kg. The X-30 is of superior quality yet remains economical, making it the most sophisticated and professional system within its price range. With the X-30 system, all of your body’s unwanted motions are isolated from your camera, leaving your camera in a balanced and suspended state until you decide to set it in motion. With the X-30, you can achieve a type of shot that will cause the audience to feel a “gliding” sensation. You can run up and down stairs, over rugged terrain, or simply circle an actress in a studio – you will always be able to accomplish the style you want regardless of your chosen set. Expandable base: The Dynamic Base Platform can also expand or retract, which will increase or decrease the system’s rotational pan inertia respectively.